Thanks to advanced technology, the HP D4263 is capable of stunning prints. Some day your HP D4263 will consume all of your printer ink, and when it does you'll quickly note that ordering HP D4263 ink is often very expensive. You don't need to stress about forking out the steep fees you'll uncover on the high street because here at Cartridge Save you can order all the HP D 4263 cartridges you will ever want at very low prices. Save more money on your ink by buying with Cartridge Save! Don't pay high prices on the D-4263 original cartridge or D4263 compatible ink down the high street when it is much easier to save a bunch of money buying with Cartridge Save. Enjoy total peace of mind when you purchase DeskJet D4263 ink cartridges from us because everything is covered by a quibble-free money back guarantee. Don't forget to take into consideration that each order also comes with free delivery, normally arriving at your doorstep next day! The Deskjet, as a concept, might seem a little outdated to you. If you've ever had the joy of owning or indeed simply accessing a Photosmart printer from the team over at Hewlett-Packard, then you will already know that there are some pretty grand possibilities out there for modern day home printing enthusiasts. Well, the HP Deskjet D4263 might not rival these printers, but there are some well-defined benefits which you too can enjoy through ownership of an HP Deskjet D4263. Here is a brief lowdown. In design terms, the HP Deskjet D4263 offers something a little different. Though this is clearly something of a basic model, a lot of thought has gone into the overall look and shape of the HP Deskjet D4263 and this is easily notable in the fancy silver finish in which this printer is available. Features on the other hand are kept simple which means that the HP Deskjet D4263 might catch the eye, but it won't hog the limelight. 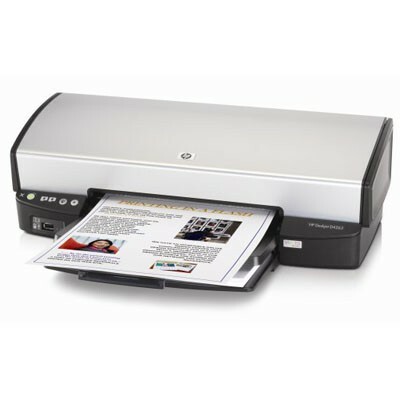 The cost effective nature of the HP Deskjet D4263 is certainly the most alluring aspect of this budget machine. In truth, should you be looking for a printer which can produce high quality items without costing you the earth, then the HP Deskjet D4263 is up there with the best. Obviously, the HP Deskjet D4263 has its limitations and these should be noted before purchasing. However, a budget printer is rarely as impressive as the HP Deskjet D4263 in terms of print outs and quality so anyone who is seeking a cheap and effective unit might benefit from considering an HP Deskjet D4263.